If Stalin could return to his home town in the central plains of Georgia, he would have reason to be gratified. Sixty-two years after his death the modest house where he was born is carefully maintained as a shrine in his honour. The brick and wood house, now encased within a pavilion, is part of a large museum dedicated to his memory. It pulls in the punters and puts a favourable gloss on the life of one of history’s bloodiest mass murderers. 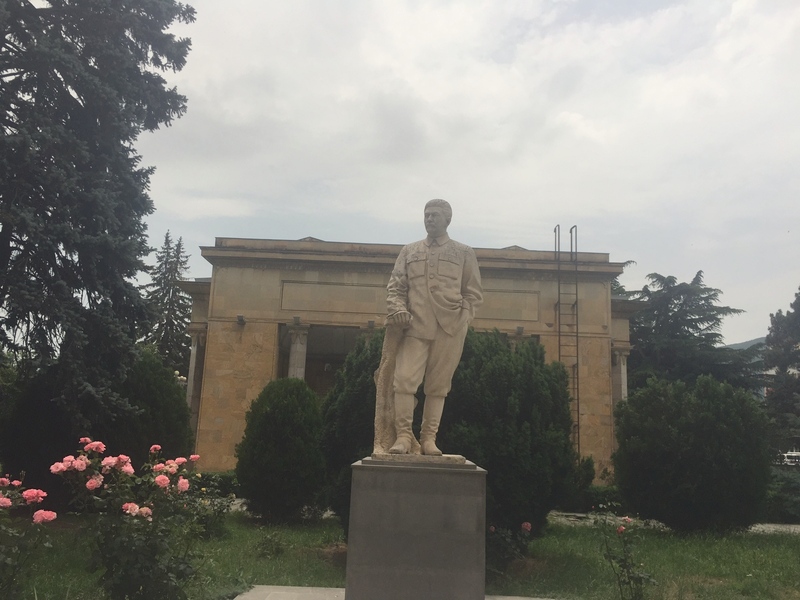 To visit the Joseph Stalin Museum in Gori is to witness first-hand the human ability to present a selective truth which is a travesty of reality. Having decided to take the pulse of the South Caucasus I cannot ignore this monument to Stalin, born Joseph Vissarionovich Djugashvili. He was by any measure a political Colossus of the 20th century and some Georgians still honour him. The violence of his rule is given very little prominence in Gori. The first thing you notice about the museum is its sheer size. It is housed in a big palazzo with a tower and a series of arches at ground level, conveying the message that this is a place of substance. Inside there are carpeted staircases and chandeliers. During my visit an English-speaking guide materialised, a large woman of mature years who looked as if she had come straight from Soviet Central Casting. She carried a short stick to point out objects of interest and, presumably, to emphasise her authority. What followed was an interesting exercise in finely tuned propaganda. The whole performance was skilful to a degree. She told us things that were interesting and true – always a sound policy. 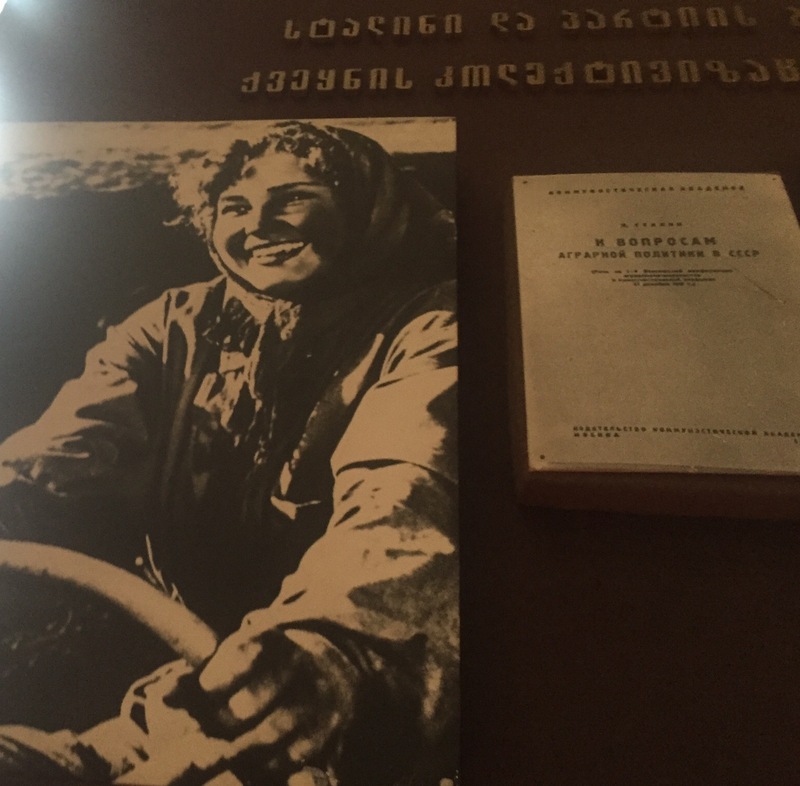 She related that Stalin was a poet who had verse published in the Georgian language, that he was a most gifted singer. An example of Stalin’s poetry hangs on a museum wall. But one rather awkward exhibit she ignored totally. She had nothing to say about a famous postscript to a Testament written by Lenin in 1923, a year before his death, describing Stalin as “too rough” and calling for his dismissal as General Secretary of the Communist Party. The museum’s treatment of this Testament is symbolic of what feels like a real ambivalence over how to deal with the whole subject of Stalin. On the one hand, it is to the museum’s credit that Lenin’s criticism is on display. On the other hand, the text is presented solely in Russian, which limits its usefulness as an exhibit. The museum has one section on Stalin’s family, a delicate topic. The guide told us in neutral tones that Stalin’s first wife died of typhus and the second committed suicide. That’s the wives dealt with then. She put the spotlight firmly on his son Yakov, who was a prisoner of war of the Germans in the Second World War. The Germans offered to swap Yakov for Field Marshal Friedrich von Paulus, captured by Soviet forces after the Battle of Stalingrad. But Stalin refused, saying of Soviet soldiers “All of them are my sons.” Yakov died at the Sachsenhausen concentration camp in 1943. The point of the story is clear – Stalin was a leader who wasn’t swayed by personal feelings. It could be argued that a museum dealing with a political leader does not need to focus much on the man’s wives. But for the record, Stalin’s first wife, Ekaterina (née Svanidze), died at the age of 22 after he took her to live in the hot, dirty city of Baku, while he led what British historian Simon Sebag Montefiore called “a life of banditry, espionage, extortion and agitation”. His second wife, Nadya Alliluyeva, shot herself through the heart with a Mauser pistol at the age of 31, after a public row with her husband, by now Soviet leader, at a Kremlin dinner party. She killed herself on 8 November 1932, the day after the 15th anniversary of the Bolshevik Revolution. The official announcement said that she died of appendicitis. Against the odds, the museum creates an upbeat mood, with use of classic Soviet propaganda. There on one wall is an iconic poster of an attractive woman tractor driver, beaming ecstatically as she lives the Soviet dream. Our guide dealt with the whole subject of Soviet collectivisation of farming in a few brisk sentences and said that “mistakes were made”. I saw nothing in the museum chronicling the famines that swept the Soviet Union as a result of Stalin’s policies. Welsh journalist Gareth Jones did more than anyone else to alert the world to hunger in Ukraine in 1933. Defying a travel ban, he went to Ukraine to see for himself and reported that he found “famine on a colossal scale”. Snyder estimates that about 3.3 million people died of starvation or hunger-related illness in Soviet Ukraine alone in 1932-1933. 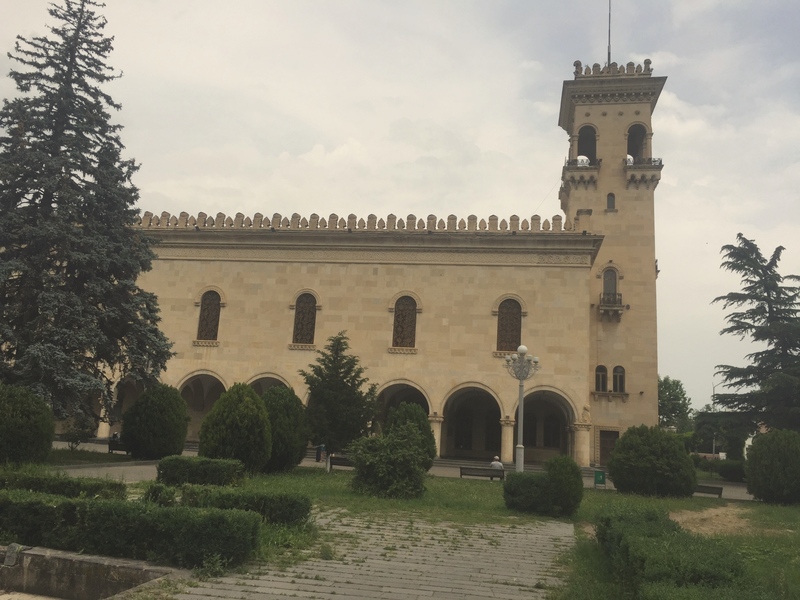 Another subject ignored in the Gori museum is Stalin’s treatment of the citizens of other countries. 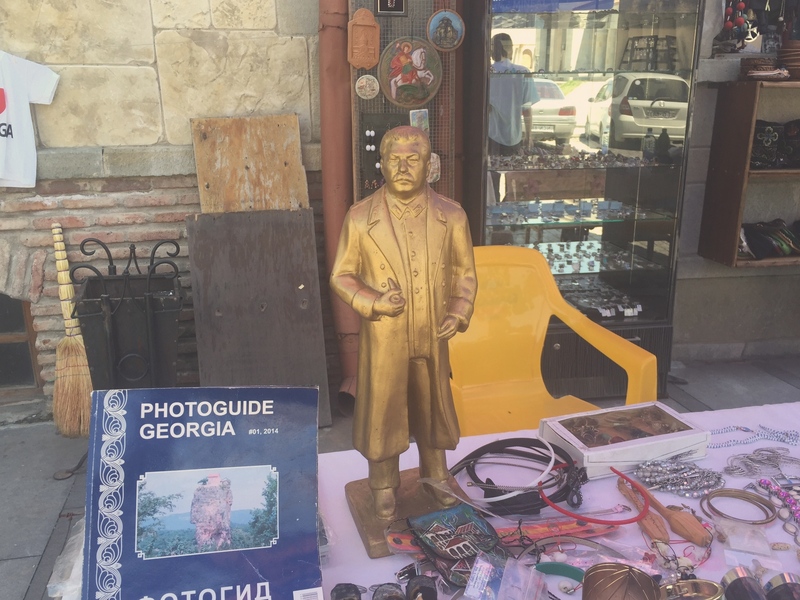 Many Polish tourists come to Georgia, but I can’t imagine that the museum in Gori is high on their list of priorities. One of Stalin’s crimes that will live in infamy is the Katyn Forest massacre of about 22,000 Poles in 1940. Stalin’s government blamed the Nazis and the Moscow government admitted only in 1990 that it was Soviet bullets that ended so many Polish lives. It is hard to read about these killings even today without shedding a tear. The victims were mainly Polish officers but also included engineers, doctors, lawyers, teachers, priests and journalists. They had fallen into Soviet hands after the Soviet Union invaded Poland in 1939 and the motivation for the slaughter seems to have been to weaken any future Polish state. The chief executioner of the Soviet NKVD secret police, Vasily Blokhin, carried out many of the killings. Wearing a butcher’s leather apron and cap, he personally shot 7000 Poles over 28 nights. The only part of the museum devoted to the subject of Stalinist violence is two small rooms on the ground floor. One room is a reconstructed secret police interrogation room and the other is a prison cell and ante-chamber adorned with the clothes of Gori citizens arrested and shot under Stalin. This section was added five years ago. Our guided tour of the museum ended in a railway carriage which Stalin used for the last 12 years of his life – he didn’t like flying. Standing in the carriage’s dining room, I asked our guide what Gori citizens feel about Stalin today. “I don’t know,” she said, but then added: “I think most of the older generation like Stalin.” Any other answer would have stretched credibility. The guide’s entire demeanour throughout the tour was one of deep respect and admiration. Back in Tbilisi after my Gori visit, strap-hanging in the city’s metro, I noticed that the man next to me was reading a magazine article which included a photo of Stalin looking every inch the handsome father of the nation. Monster though he was, Stalin is clearly a part of the mental landscape of Georgia still. The website garethjones.org has details on the life of journalist Gareth Jones.